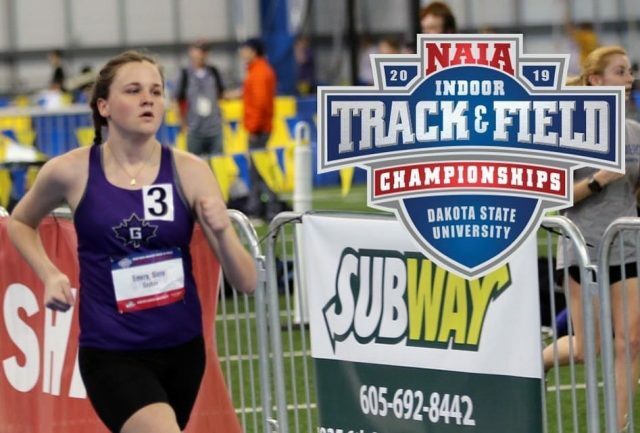 Siana Emery highlighted a group of four Maple Leaf track and field competitors with a fourth place finish in the national championships last Friday in Brookings, South Dakota. The junior race walker finished with a time of 15:39.98, her second fastest time of the season. She finished as the first athlete not from Judson University, as the Eagles claimed the top three spots of the event. A fellow race walker, first-year Hayley Bickford finished with a time of 17:33.51, good enough for 11th place overall. She was the second finisher among first-year competitors. Sophomore weight thrower Suzette Rodriguez continued her impressive 2018-2019 season with a 51 feet 2 inch throw, giving her a 22nd place finish. In the final event for the Maple Leafs, freshman high jumper Simon Graber Miller looked to improve on what was already a standout first season. Graber Miller did just that, tying the Goshen school record clearing 6 feet 7.5 inches. He finished one height away from being able to call himself an All-American. In the end, he finished 14th overall. As the indoor season comes to a close, track and field athletes get a well-deserved break before the outdoor season starts on March 23 at the Indiana Wesleyan University Polar Bear Invitational.